One of the interesting things about going through the 1940 census is seeing how much money my relatives were earning in 1939. For the most part, my relatives were earning between $500 and $1500 a year. So, I was surprised to see that my great uncle Joe Smith (Jose Pacheco) was making $2,300 a year in 1939, according to the 1940 census. They were one of the few in the family who held on to their home during the Depression. It was valued at $4,500 in 1940. They also owned a piano. They made trips to back and forth to Hawaii. I’m going to have to say they were doing pretty well for themselves coming out of the Depression. 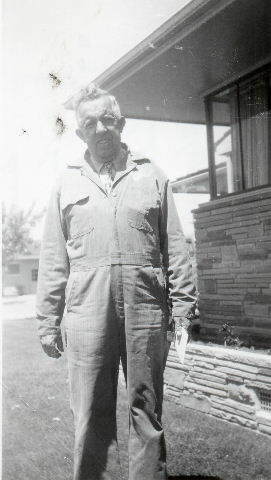 Up until 1937, Joe worked on the Spreckels Sugar Beet Farm like so many of my Portuguese relatives. He and Minnie had lived in Salinas since they were married sometime right after World War I. While most of the Pacheco’s and their cousins had moved back to Oakland for work, Joe and Minnie stayed. Sometime around 1936-1937, Joe left the sugar beet farms behind. He became a mechanic for Farmers Mercantile Inc. From what I gather from the little research I’ve done, Farmers Mercantile was a sort of farm equipment supply/hardware store. Joe was a mechanic who worked on farming equipment. The pay was good compared to others in the family who were still struggling to get their footing after the Depression. This is a photo of Joe at work ca 1943. Notice the tie under his mechanic’s coveralls.